← NAEP Results Are In. No Answers to Important Questions. It’s not new news anymore that gains in life expectancy have leveled off in the United States, driven by startling and unexpected declines among young and middle-aged whites. The so-called “deaths of despair,” including drug overdoses, are on the rise. So are liver disease (associated with alcoholism) and suicides. Chronic diseases associated with obesity such as diabetes, heart disease, and stroke are up, too. The map above shows changes in the probability of death among 20- to 50-year-olds in the 50 states between 1990 and 2016. There is a remarkable divergence — health for this age group has improved significantly for some states, including Virginia, and gotten worse for others. A breakdown by county in Virginia would be revealing. I hypothesize that western Virginia, especially the far Southwest, would show patterns similar to neighboring West Virginia and Kentucky. Although a more granular look at the data might reveal a different pattern, it appears that Central Appalachia is ground zero for deaths of despair. 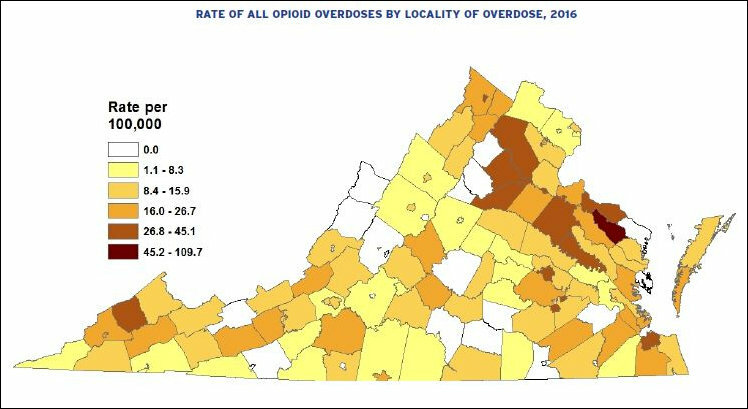 I don’t know if opioid deaths in Virginia measures quite the same distribution of “deaths of despair” but it’s striking to me that in the national data the entire southeastern seaboard is blue (plus much of the northeast). Is that a reflection, perhaps, of the concentration there of college towns and those walkable urban centers of employment that are so attractive to better educated yuppies, as opposed to the employment wasteland of Appalachia on both sides of the mountains? You are right, Acbar. All that Blue on the eastern seaboard looks very fishy. For example, drug addiction and death continues to spike on Maryland and Virginia Eastern shore as best I know. This chart likely suffers from the same problem that afflicts the Tourist Bureaus statistics, and Global warming Stats. I’m guessing that migration is a factor. First however, the national average is right between light blue and dark blue. So, if Georgia is 1/10th of 1% lower than the national average it gets dark blue. Hard to say whether the differences between light blue and dark blue are statistically significant. Back to migration. We talking about 20 to 50 years olds from 1990 to 2016. The higher death rate states look suspiciously like the same states that have been losing young adults to lack of economic opportunity. Who leaves and who stays? I’d guess that the kind of person with the gumption to pack up and move out looking for greener pastures is slightly less less likely to be drug addicted, depressed, etc. Meanwhile, the “stay behinds” who can barely make ends meet are slightly more likely to be drug addicted or depressed. Please note that none of my conclusions have been contaminated with any facts whatsoever. Curious that in the eastern U.S., West Virginia and Kentucky have the worst rates. What do they have in common? They are both coal states. for 150 or so years, all the wealth has been taken out of the states leaving such records behind. When you say “all the wealth has been taken out of the states,” what does that mean? So, it’s not as if the coal industry didn’t create a lot of jobs, a lot of wealth, and a lot of community assets like libraries, concert halls, hospitals, orphanages, and the like. Clearly something happened. What was it?